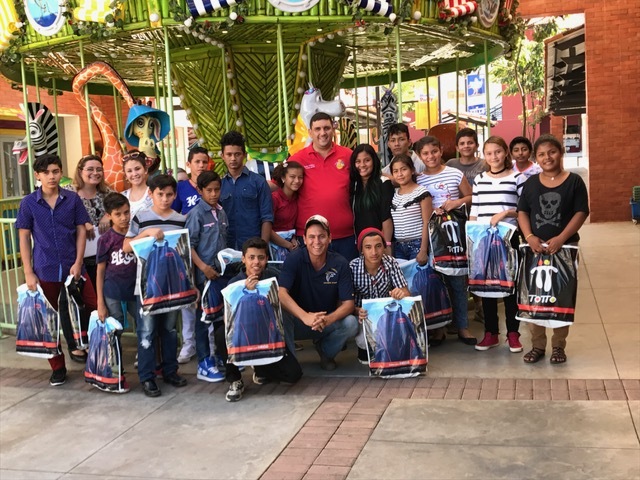 We had a fun time last week visiting Club Cristiana La Esperanza with some high school students from Westminster Christian School in Miami, FL. They were in Nicaragua to build a mercy home for a family in need with Open Hearts. You can check out the blog they updated during their trip here. But in the middle of it all, we took some time to visit the Early Childhood Education Center at Club Esperanza. And guess what…. Every one of our preschool and kindergarten students got a brand new backpack filled with all sorts of fun toys and school supplies and candy…and so of course the team made sure to include some dental hygiene supplies as well! It was a fun morning and a great opportunity to bring a small blessing to a child in need. The kids all loved getting their new backpacks! We praise the Lord for these very special gifts at the start of this school year. Yesterday was an exciting day down in Villa de Guadalupe, it was the first day of class! At Club Esperanza one of our biggest outreaches to the community is our Early Childhood Education Program. We have 120 preschool and kindergarten students each year. They not only get a quality accredited early education, but we have a feeding program that provides two meal a day, and a staff of teachers filled with the love of Jesus! As this 2017 school year begins we are asking for Jesus’ biggest blessings on all of our students and their families too. Yesterday was an exciting start to the school year! This program provides an incredible resource to the families we serve. As I mentioned above it is a quality education and we have a great feeding program. These are so helpful to many of the families who are struggling in an economy with massive unemployment and extremely low wages. The community where we serve has many many obstacles that would keep a child from growing up well; violence, poverty, abuse, neglect, etc…often circumstances that are unimaginable. So, we parter with as many families as we can to help the children at the youngest ages. Our hope is to impact Nicaragua for generations to come. As you can see in the pictures above, our classrooms are packed. So, please pray for our teachers throughout the year. They have a lot of work with lots of beautiful crazy little children. We are very happy to report, that the first day went great! These pictures of parent pick up time captured a pretty exciting time of the day. I laughed because when Krista and I visited our friends in NYC this past Thanksgiving we got to see this same exact experience first hand. We walked a few blocks in Queens and arrived at a school with dozens of parents waiting on the street. The kids came out, each running to their parent, and off they went. It was funny to see this exact same experience play itself out down here in Managua, Nicaragua. I was also encouraged with the perspective as well, knowing the controlled chaos of the time appears to be an international norm LOL! Our dining hall was also packed on the first day of school. We absolutely love the way that the Lord has provided for us so that we can feed so many kids each day. In fact, we feed nearly 300 children and teenagers with all of the different programs that happen at Club Esperanza. Our kitchen staff prepares good healthy meals that help keep our kids nourished and healthy. We ensure to have big chunks of protein and vegetables in each meal. Today’s menu was “Arroz con Pollo”. Another request for prayer would be for our cook and kitchen staff. Lots of meals to serve every day and they need the Lord’s strength! We had to finish this blog post off with pictures of the beautiful little faces of the children we serve. Our biggest prayer request is this, that during the school year the Lord would protect each one and help them to grow stronger, wiser and healthier while they are in our care! We look forward to a great year. We have a group of high school students at Club Esperanza that we select every year to be a part of our High School Scholarship program. It is a solid group of kids who come from various different family backgrounds. Some of them have parents who are working hard and this group provides an assistance to them to better their child’s future. Some of them come from homes with parents that really couldn’t care less about their future. For these, their involvement in this group is entirely an individual effort to try and break out of the cycle of poverty by getting their High School degree..
We love this aspect of ministry at Club Esperanza and look forward to working with these students. Something you can be in prayer about for them, is the formation of a youth group at Club Esperanza. A weekly meeting where they would be the leaders of the group, but it would be open to all of their friends in the neighborhood. We are laying the groundwork now and hopefully will launch this youth group in the coming months. This blog post however is highlighting a fun day we had this week. School starts next Monday, so it was time for back to school shopping. We shopped for uniforms, shoes, backpacks and school supplies and just had a good time hanging out together for the day. We would like to say a special thank you to Love Light & Melody for their support of our High School Scholarship program this year! If you would like to donate to support the children at Club Esperanza we would be very thankful…we need your help to impact these young lives!